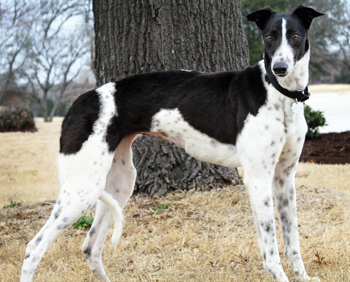 Bea is a 2-year-old white and black female born April 2009. Her registration number is not legible due to it being double tattooed, and her litter letter is not clear either. Bea was found as a stray and taken to the Amarillo Panhandle Humane Society. Ironically, Bea's birth month and year are the same as Hunter's, and both their registration numbers are double tattooed. They were both found as strays in the same area in Amarillo, but Bea was found 5 months later than Hunter. Bea's ears are very ragged, and she has several outstanding scars. She is very people oriented and loves belly rubs! Bea is not small animal or cat tolerant and would do well as an only pet. As a stray Bea learned to be fearful of other dogs and unusual noises or movements in her surroundings. But Bea is learning to be brave! She is working on exhibiting calm and polite behavior around other dogs, and loves getting rewarded for doing so. Bea has come a long way, but still prefers that other dogs stay out of her space. Although Bea needs help learning to be brave outside our home, inside is another story. Not only does Bea 'roach' on her back but she does so while snoring with her tongue hanging out. Bea has displayed not even a hint of separation anxiety - she is relaxed when I leave and relaxed when I come home. The crate is her favorite place to hang out, and she LOVES having a safe place to go to. Bea is not very vocal - she barks just enough to remind me that she's hungry or needs to go out. Toys need to be durable around Bea - she plays rough with them, shaking and chewing on them. Bea would do better in a home without young children as the noise and bustle makes her nervous. But calm, older children who want to help with her training would be fine. She would love to be taken on regular walks, and a yard to romp in would be a bonus. Bea is the easiest foster dog I've cared for. She is very playful, crates exceptionally well, and has never had an accident in my home. She even relaxes for her pedicures with the Dremel tool. Bea is petite, ADORABLE, and intelligent - she's a good girl who will be a fun dog for the right family!